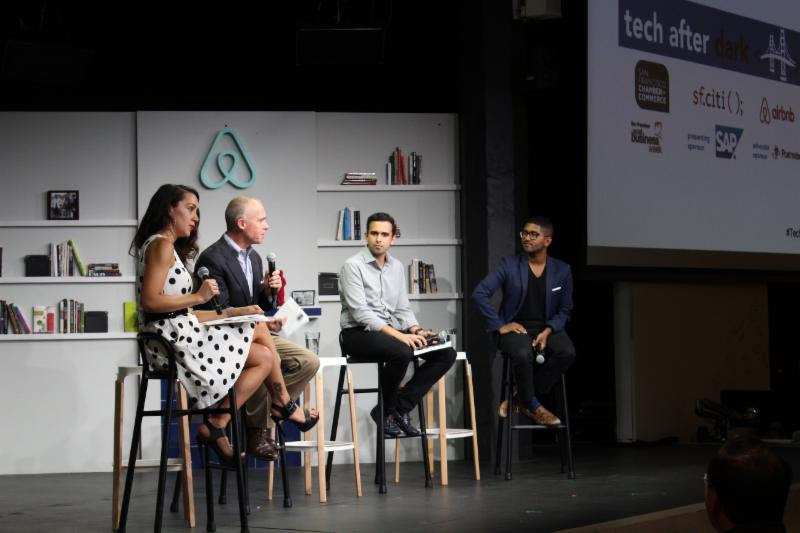 On Wednesday, May 16, leaders from San Francisco’s technology and business communities collided at Airbnb headquarters for “Tech After Dark,” organized by sf.citi, the San Francisco Chamber of Commerce, and, of course, our generous host Airbnb. Timed and themed around San Francisco Small Business Week, the event explored today’s changing business landscape, which is increasingly powered by modern technology. Techies, small business owners, and everyone in between took their seats as sf.citi Executive Director Jennifer Stojkovic posed the first question: How have today’s technologies made it easier for small businesses to level and scale? Our panelist from Square, Antonio Silva, cited a study revealing that 72% of small businesses face more challenges to growth today than in the past. However, 65% of those surveyed reported feeling more able to handle those challenges…in large part thanks to the tools made available to them through tech. sf.citi is calling on our members to continue the tradition of cultivating the next generation of tech talent right here in San Francisco by participating in Future Grads. Future Grads guarantees local high school students a seven-week, paid internship at sf.citi member companies—fully funded by sf.citi! What better way to determine the course of your future than learn from experts in the field. That is the idea behind sf.citi’s Future Grads program, organized in partnership with the San Francisco Police Department. For the past six years, San Francisco high school students have gleaned rare insight into the heart of tech industry by interning with sf.citi member companies and partners via Future Grads. Employees and students alike at participating companies and organizations—including AdRoll, Techtonica, Meals on Wheels, and Meadow—have had nothing but rave reviews for Future Grads. Catherine Waite of Coinbase described Future Grads as a great way for employees to “connect with and mentor a high school student and connect with the community.” Meanwhile, several of our former interns have credited Future Grads with giving them greater clarity about their career path, while others reported a deeper appreciation for the collaborative environment of the tech world. 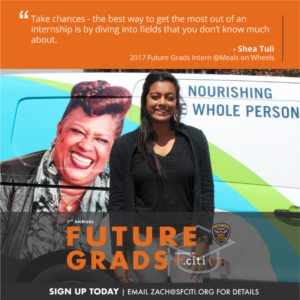 Sign up for Future Grads today by emailing zach@sfciti.org. sf.citi traveled to Lyft last week to meet with District 11 Supervisor Ahsha Safaí. Greeted by representatives from sf.citi member companies Airbnb, Alaska Airlines, Facebook, and several others, Supervisor Safaí wasted no time in setting the agenda for the day’s discussion: Proposition D.
Question for Supervisor Safaí: How did we get in this housing crisis? Safaí pointed to 2013-15 when homes in District 11, among other areas in the city, were still “reasonably priced.” Describing the sudden explosion of housing prices, Supervisor Safaí attributes today’s housing crisis to the “stark contrast” to San Francisco’s not-so-distant past—a contrast that has only become more accentuated in recent years. 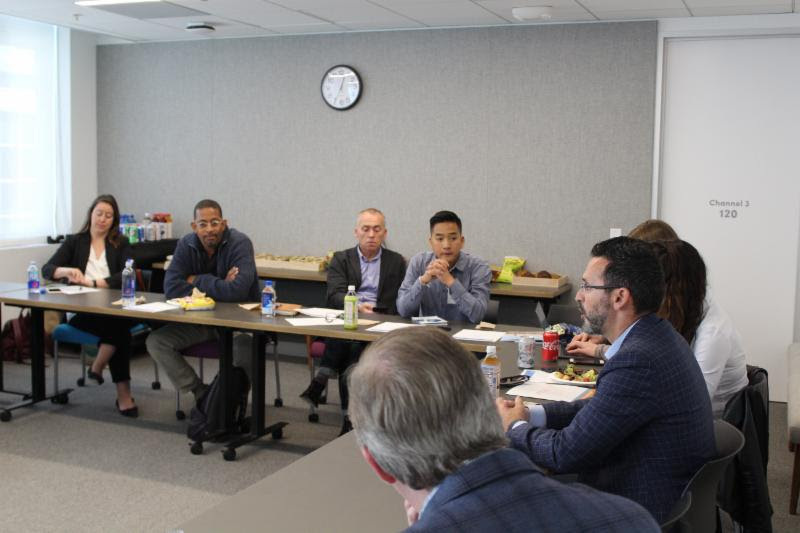 Want to converse with more influential San Francisco policymakers and candidates in future Lunch and Learn discussions? Become an sf.citi member today! The June 5th election is less than a month away! Luckily, sf.citi has prepared a June 2018 election toolkit, complete with our Ballot Measure Endorsements and a closer look at the leading candidates in this year’s mayoral lineup – take a look here.